Wellesley celebrates Latina Month in April with performances, lectures, panels, workshops, and discussions (event listing at bottom of page). "The main goals are to celebrate the cultural diversity that Latino students, faculty, and staff bring to the college community as well as raise awareness about issues affecting the Latina community at Wellesley and beyond," said Mared Alicea-Westort, Wellesley's advisor to Latina students. A Latina Month Planning Committee plans events for the month with representatives from all the Latina organizations on campus plus students at large who are not members of an organization. Alicea-Westort said, "Latina Month provides an opportunity for our diverse community to work together toward the goals of cultural celebration and overall community education." The Latina Month Planning Committee nominated Caruso-Cabrera to be the keynote speaker because, said Robin Lush of the Office of Advisor to Latina Students, “We wanted to highlight a prominent Latina alum who would provide inspiration and guidance to students as they planned their academic and career paths based on their personal and professional goals.” Caruso-Cabrera has earned critical acclaim as an author and network broadcaster, and has most recently earned the prestigious title of Chief International Correspondent for CNBC. After graduating from Wellesley with a dual degree in economics and Spanish, Caruso-Cabrera began her career in 1991 as a stringer for the New York Times, reporting on education issues. She subsequently worked at Univision, gaining extensive experience covering Latin America, and as special projects producer won an Emmy Award for a five-part series on children with AIDS, as well as an Emmy nomination for a report on sexual abuse by clergymen. She joined WTSP-TV in St. Petersburg, Fla., where she was a general assignment reporter until joining CNBC in 1998. Caruso-Cabrera reported for NBC News from Baghdad, covering the elections and their impact on Iraq's post-war economy, and has also traveled to Cuba, Brazil, and Venezuela to report on and produce groundbreaking stories about the economies of those countries. In 2011, Caruso-Cabrera covered the European financial crisis. Reporting live from Athens, Rome and Frankfort, Caruso-Cabrera warned viewers and users early on about the rising risk of default and the consequences for the global economy. Caruso-Cabrera has reported one-hour documentaries for the network including, "Liquid Assets: The Big Business of Water" and "The Race to Rebuild: America's Infrastructure." She also was co-anchor of "Power Lunch" with Sue Herera and Tyler Mathisen. 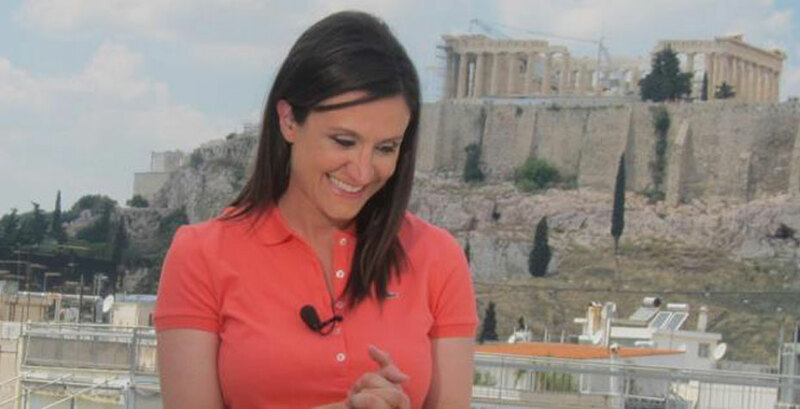 Now Caruso-Cabrera is CNBC's chief international correspondent. When not covering her beat, she anchors and reports for the network throughout CNBC's business day programming. Caruso-Cabrera wrote her first book, You Know I'm Right: More Prosperity, Less Government, in 2010, and has written a personal finance column for Shape en Espanol focusing on issues of particular importance to Latinas and was a monthly contributor to People en Espanol. Caruso-Cabrera has also been awarded Broadcaster of the Year from the National Association of Hispanic Journalists and was named one of the "100 Most Influential Hispanics" in the country by Hispanic Business Magazine. Come hear her speak at Wellesley on April 3 at 6 p.m. in Alumnae Ballroom. You can follow Michelle Caruso-Cabrera on Twitter @Mcaruso_Cabrera. This annual event celebrates the rich cultural heritage of the Latina community. Students work thorough out the year to plan the show, which features skits, dances from throughout Latin America and Spain, and a fashion show. This lecture and discussion facilitated by Wellesley College Professors Sanchez, Burke, and Mata will begin with a focus on the latest immigration policy followed by a sharing of individual immigration experiences and group discussions on how different components of the policy affect various immigrant and non-immigrant populations in the United States. An evening to honor the hard work of Wellesley’s unionized Latino employees and give thanks to these employees for the wonderful work they do on campus. A safe-space forum for students to raise awareness of our LGBTQ community. Wellesley’s Latina organizations, Mezcla, Familia, Cielito Lindo, and Alianza, host this event that offers prospective students insight into student life at Wellesley College for Latina students. Latina alumnae from different professional industries and a varying career levels will share the decisions they made and paths they took after Wellesley that were instrumental in helping them find jobs in their chosen field. Alums will reflect on their experiences when they were students at Wellesley and as Latina women in their respective fields, offering advice to current students that will help prepare them as they embark on their professional journeys in a highly competitive global marketplace. Mezcla, Wellesley's largest Latina student org, organizes an annual poster campaign to raise awareness about the Latina community and Latinos in general. This year's Latina Month Poster Campaign highlights the diversity within the Latino/a community and expresses the needs of Wellesley Latino/as on campus. In the form of a mock test, with true-false statements and multiple choice questions, the posters capture and engage attention, aiming to correct commonly held misconceptions about Latinos. The goal is to stimulate conversation and thoughtful discussion within the greater community about the reality of being Latino/a at Wellesley.